This chapter guides you through the process of importing samples into HISE. We'll be using samples with well-formatted file names, that means that the mapping information can be fully extracted from the names without having to use the mapping editor. There are a multitude of ways to map audio files in the sampler, from drag 'n drop to batch processing via regex commands. However I strongly recommend using a strict file naming scheme. There is a powerful file name parser in HISE which allows to map the samples automatically so if you do it right, you'll never have to touch the mapping editor ever. For the sake of simplicity, extract and copy all samples you want to import into the Samples subfolder of the new project (you can also opt to redirect the sample folder to another location, which is useful if you have a large sample library on another hard disk). You need to create a sampler module that the samples will be imported to. Click on the + icon next to the "Master Chain" label and select "Sampler". You can use multiple sampler modules within one patch (and for more complex projects it is obligatory to do so). However for our little tutorial, one sampler should be enough (we'll be adding some synths later too). File Browser A file browser with drag 'n drop functionality and a preview function (currently for images only). Sample Editor Edit the properties of the selected samples. Sample Map Editor Edit the mapping of the current SampleMap. You should already be in the project folder. 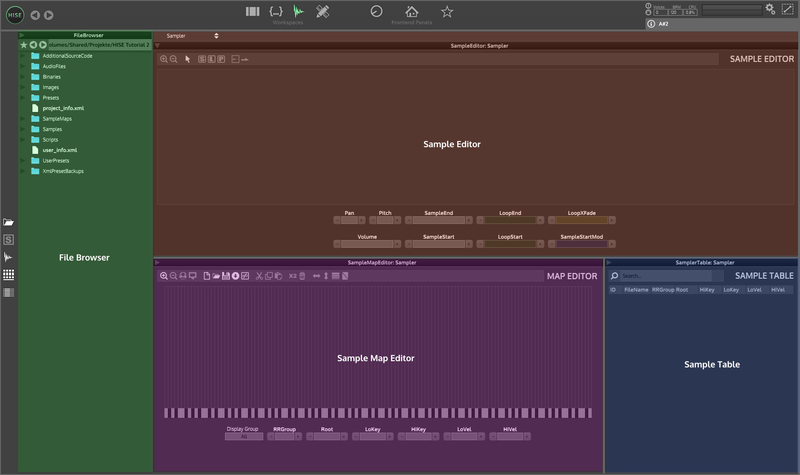 Double click on the 'Samples' folder, select all samples (Cmd / Strg + A) and drag them into the map of the sampler. Select "Filename Token Parser" and press OK". For a detailed explanation of the file import dialog, please refer to the chapter in the Reference Manual. There are gaps between notes because it is not chromatically sampled. So we need to get our hands a little dirty and fix those issues manually in the sample map editor. To fix the gaps, select all samples by dragging the lasso and click on the "Close vertical gaps icon". Afterwards you should save your current Samplemap via the Save-Button(Floppy Disk) or with [Ctrl-s]. It will now reside in your projects SampleMaps folder as an .xml file. 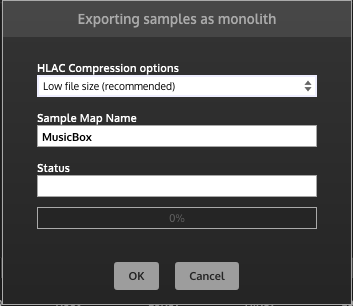 Now you should have a .xml file in your SampleMaps directory and a monolith file with the extension ch1 in the Samples directory (if you export multi mic samples, they will have the extension ch2, ...). The file size went down from 12MB to 4MB. If you have multiple sample sets, you can export each one as dedicated sample map and use scripting callbacks to switch between these samples. That's it. You now have a perfectly mapped sample set ready to be played. In the next chapters we will add some modulators and effects to the patch.